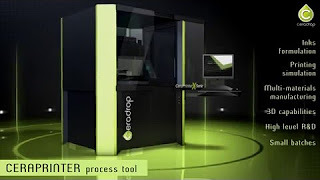 CeraPrinter X-Serie is a TurnKey Materials Deposition Inkjet tool for process development in Printed Electronics and Smart 3D Printing. 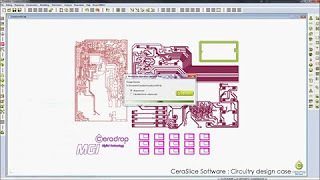 File format Step, DXF, Gerber, GDSII, Bitmap. pre-loaded patterns Square transistors, circular transistors, multilayer capacitors, induction, coil, etc. 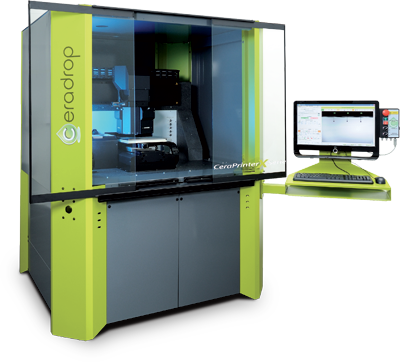 The whole CeraPrinter equipment range is high accuracy multi-material deposition systems with in-line multi- curing technologies, in-situ characterization facilities embedded simultaneously enabling high precision deposition of functional materials and full area curing in each pass. 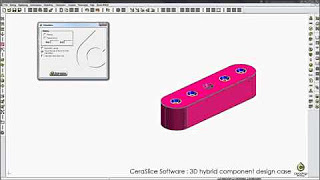 Evolutionary at lowest cost and delivered with exclusive software suite developed by CERADROP (CeraSlice, DropAnalyser and FabAnalyser) allowing its quick start- up, easy to use and bottom-up approach for functional components design. To go forward with our customers, we provide strong partnership, highly qualified, responsive worldwide maintenance and support team to provide assistance through each stage of project development.